Delete looks at the surprising phenomenon of perfect remembering in the digital age, and reveals why we must reintroduce our capacity to forget. Digital technology empowers us as never before, yet it has unforeseen consequences as well. Potentially humiliating content on Facebook is enshrined in cyberspace for future employers to see. Google remembers everything we've searched for and when. The digital realm remembers what is sometimes better forgotten, and this has profound implications for us all. 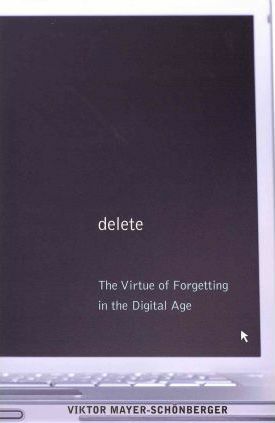 In Delete, Viktor Mayer-Schonberger traces the important role that forgetting has played throughout human history, from the ability to make sound decisions unencumbered by the past to the possibility of second chances. The written word made it possible for humans to remember across generations and time, yet now digital technology and global networks are overriding our natural ability to forget--the past is ever present, ready to be called up at the click of a mouse. Mayer-Schonberger examines the technology that's facilitating the end of forgetting--digitization, cheap storage and easy retrieval, global access, and increasingly powerful software--and describes the dangers of everlasting digital memory, whether it's outdated information taken out of context or compromising photos the Web won't let us forget. He explains why information privacy rights and other fixes can't help us, and proposes an ingeniously simple solution--expiration dates on information--that may. Delete is an eye-opening book that will help us remember how to forget in the digital age. Viktor Mayer-Schonberger is professor of internet governance and regulation at the Oxford Internet Institute, University of Oxford, and a member of the academic advisory board of Microsoft. His other books include "Governance and Information Technology". A former software developer and lawyer, he spent ten years on the faculty of Harvard's Kennedy School of Government.